The FEAR Ultimate Disc club has been around informally in one form or another since around 1997, however in 2006 it became an ‘official’ registered club entity in order to enter a Master’s team into the 2006 World Ultimate Club Championships hosted in Perth. We’re now expanding the club to eventually reach into every division: Open, Women, Mixed, Master’s and Junior divisions. Feel free to join us on at our practice session or on Monday nights at Medina. Ultimate is a team sport played with a flying disc (frisbee). It’s a fast, free-flowing game played world-wide, combining elements of netball, soccer, grid-iron and touch footy. The basic aim is for the team with the disc to pass it up the field to others on their team and catch it in the end zone. At the same time the defensive team is trying to intercept it or knock it down. If they succeed, they get possession of the disc and attempt to score in their end zone. Ultimate is unique in that there are NO REFEREES. The players themselves make all the calls for infringement of the rules. Strangely, this concept actually works – even at World Championship levels. Respect for the game, the rules, and the players is what makes it work. This also makes Ultimate an incredibly SOCIAL sport, suited for all ages, and all levels. It’s because of our long-standing association with cucumbers. 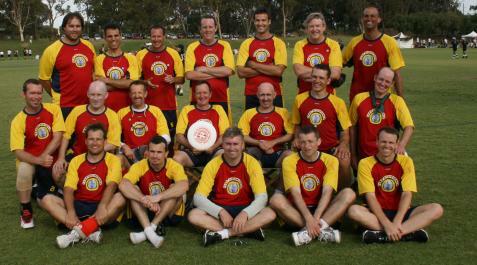 In 1999 a team called Cucumbers in Kakadu joined the Perth Ultimate League. The history behind the choice of that name is no longer discussed out of respect for those involved who are quite embarrassed by the entire “incident”, but it does explain why our team colour is green. When they joined the league the Cucumbers team had been playing for a short while under the guise of WAPET Discoverers. As the Cucumbers – a team consisting of a few experienced players and lot of beginners – started to gain more game experience, and picked up a few veteran players, they began to have more success. The name of the team in the next league was changed to ‘Fear the Cucumber’, that name choice being in line with previously well established vegetable references, as well as having a ‘tougher’ image – and making people wonder why they should be so frightened of a common salad ingredient. After a couple more name changes, the team eventually became known as just FEAR. The FEAR team managed to win PUL 12 after a few despairing 2nd placings. After accumulating a few more players, there were enough to form 2 teams for PUL, with the names ‘Worry’ and ‘Concern’, since each team on it’s own was less than the full FEAR. In 2006, after some intermediate name changes, these teams were renamed FEARsome and FEARless. The teams would still combine for larger tournaments, such as Phoenix (WA State Ultimate Championships) and the Winter Solstice tournament. FEAR has performed well at Phoenix in recent years, finishing 2nd in 2003, 2004, and 2006, but still chasing the elusive win. In 2006 the senior members of the club combined with players from South Australia to form FEAR Discinsonia, in order to compete in the Masters Division at the World Ultimate Club Championships. Again, the Fear team joint with the Buttermonkeys for another fun filled tournament in Sanur, Bali (25.-26. March 2016). The 17th Annual Bali Nusantara Cup was themed THE HUCK AWAKENS. The main objective was to have fun, enjoying the games and mingle with the other teams. As always some great fun games were played as well, like the hairy chest guess competition or the mingle, mingle, mingle game. In 2015 Fear joint with the Buttermonkeys from Bunbury to compete as Simia Phobia at the Annual Bali Nusantara Cup in Sanur, Bali (3.-4. April 2015). The team had great fun playing ultimate disc, as well as competing at other little games like Boat Race and of course partying with all the teams. FEAR Discinsonia is a combined team of players from the FEAR club in WA, and Discinsonia from South Australia. Neither club had enough players to field a full squad in the Masters Division at the World Ultimate Club Championships in Perth in 2006, so we fielded a combined team. The team performed increasingly well during the week as they came to know each other better, however despite a couple of close results were unable to win a game. Early in the week however the team set themselves the goal of winning the Spirit prize for the division, a goal that they achieved. Congratulations to all players, in particular those who found themselves playing in a world championship with less than 12 months of experience behind them.